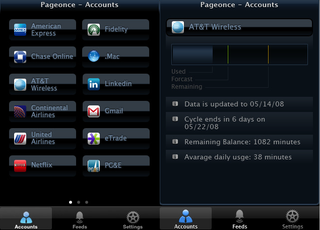 Lifehacker covered the web version of PageOnce already, but think of it is as a web portal that displays all your various utility, credit card and shopping accounts in one page for easy glance-ability. This is the exact same thing, except on your iPhone. We love it. Enter in your logins to your Wells Fargos, your Netflixes, your Comcasts and your Diggs once and you'll be able to check them out on the go. Wondering whether that check cleared? Just tap your bank's name and it'll come up with your account info. Want to know when that movie is due from Blockbuster Online? When your next utility payment is due? Easy.